In a large bowl, combine egg substitute, pork, rice, dried cranberries, salt and pepper. Shape into meatballs about 1-1/2 inches in diameter (you should end up with about 48). In a large skillet, heat half of the olive oil over medium heat. Brown as many meatballs as will comfortably fit in your pan. You don’t need to cook them through, just brown on all sides. It should take about 5 minutes. Drain meatballs on paper towels. Continue until all meatballs have been browned, adding olive oil as necessary. 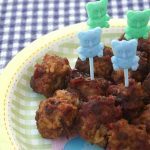 Transfer meatballs to a slow cooker. In a medium bowl, whisk together cranberry sauce, ketchup, orange juice and lime juice until combined. Pour mixture over meatballs in slow cooker (don’t stir). Cover and cook on low for 3 to 4 hours or on high for 1-1/2 to 2 hours. Make-ahead tip: Make the meatballs and brown them ahead of time. Refrigerate or freeze until ready to use. Mix up the sauce ahead as well and store in refrigerator. A few hours before your shower or party, put the (thawed) meatballs and sauce in the crock pot.